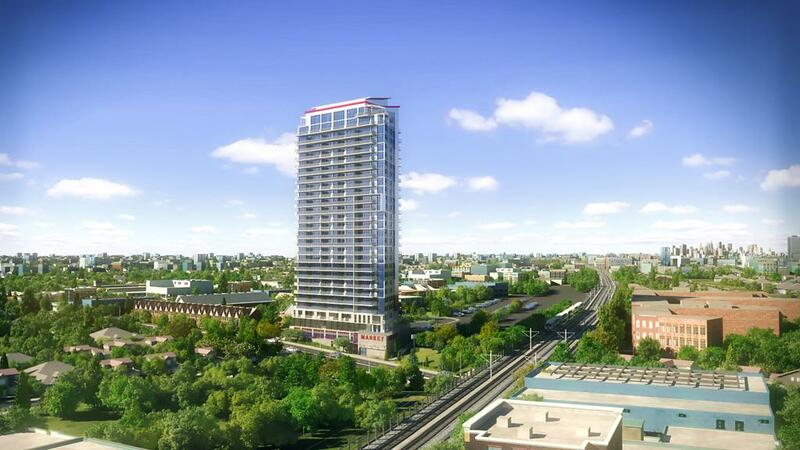 ON THE GO MIMICO, a new condominium residence, located on Royal York Road just steps from the Mimico GO station. Your new home will feature uncompromising design, functionality and amenities while providing quick access to downtown Toronto on the GO train. Priced from the mid $200s, this exciting new location features convenience and accessibility — in a range of appealing suite sizes. There are only 242 residences available so don’t miss this preregistration opportunity today at ON THE GO MIMICO. On-the-GO Mimico is a 26-storey condominium building, by McCallum Sather Architects, conveniently located adjacent to Etobicoke’s Mimico GO Station. The most significant aspect of the project is that it will be the first Toronto residence with direct access to the GO Train. The design includes 242 suites (inclusive of loft-style penthouses); spacious balconies in each suite, with an unobstructed view of the cityscape and lakefront; and a retail ground floor with in-house amenities such as a grocery store, coffee shop, fitness centre, party room and guest suite. Most notable to MSA, the project includes a number of MSA’s signature sustainable features which allow for the building to exist in tandem with the environment and its surrounding neighborhood. Features: Suites will have Cambria or Caesar Stone kitchen and bathroom countertops, glass mosaic tile backsplashes, and rain-style shower heads and soaker tubs in the bathrooms. Amenities: The project will feature party rooms, a leisure area and a fitness centre. Standouts: The site will have retail elements onsite, with an upscale fine foods grocery shop and a coffee shop planned.